This is the result of making double crosses. I have included the first ones made of just two fabrics (hmmm, a future project), the bottom of the three improv blocks was made using free-pieced fabric, which I thought was too busy to show off the crosses and the top two with free-pieced strings. It was definitely fun and, of course, went way beyond 15 min as it grew. I don't think I am thru with crosses and want to play some more with them. LOVE those string pieced crosses! Have a great snow/sew day! What a fun project! 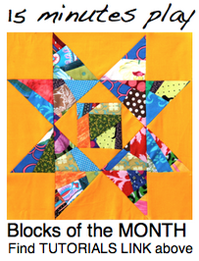 Tshe blocks with more colour are definitely more interesting, though the top blocks would make a great bigger quilt! With wonky sashing? Oh, do I love these! Never thought about incorporating little creations into a bigger block like you have - a bigger, liberated block, that is. Very cool! I've been a fan of these ocks from the get go... I wonder how the top ones work with the second photo... Hmmm, I may take 15 minutes just to ponder that! Hehe... Enjoy your snow day!! Bonnie, These are great!I love them all.